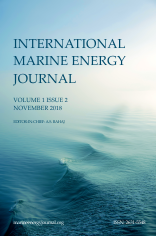 Biofouling by benthic organisms must be considered for tidal turbine operation and maintenance because it modifies hydrodynamics (drag and resistance) and could be detrimental to the turbine performance. We investigate vortices modification downstream a tidal turbine due to biofouling using numerical modeling. Firstly, 2D flow downstream a clean Darrieus vertical axis tidal turbine is simulated using a dynamic mesh for different tip speed ratio. Results agree the former studies. Simulations are very sensitive to turbulence modeling. To ensure an acceptable computing time, only LES and RANS are used. Secondly, an airfoil with barnacles is modeled in two dimensions for various fouling height and spacing with different flow incidences. Barnacle height has more influence on flow than the barnacle density. Then barnacles and mussels with various characteristics are fixed on blades. Vorticity fields are strongly changed by organism shapes. Mussels size has little impact on vorticity patterns. A few mussels could have stronger impact than a fully colonization. A 3D simulation is performed with a shape of barnacles from new in-situ measurements. Finally a colonized tidal turbine is simulated is modelled.